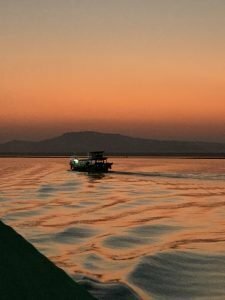 How is the Fantasia sunset boat trip in Bagan, Myanmar? 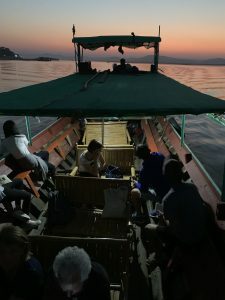 Based on enthusiastically favourable reviews online, we decided on the Fantasia boat, to witness the “must see” sunset over the river in Bagan. However, since we were totally underwhelmed by the whole experience, it seems only fair that I put a dissenting view on record. I’d hate future travellers to feel disappointed, the way we were. 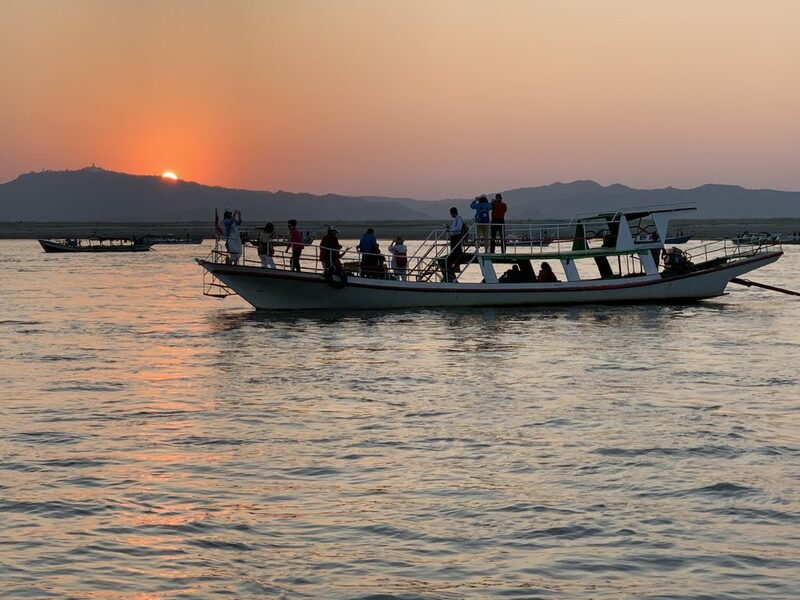 We were a mixed bunch on the 2 boats that set out that evening from Old Bagan. Loads of yuppy French youngsters, one of whom was ill and another of whom was celebrating her birthday. A smaller group of Spanish youngsters, one of whom had misplaced his mobile phone & was a little stressed. A quiet Chinese couple. A very quiet lone Japanese man. A late-middle-aged French couple. And us, a Brit and an American, 2 women of a certain…hey, our ages don’t really matter for the purpose of this review, but let’s just say we were not there for the booze, as most of the youngsters seemed to be. We were loaded into a little pirogue to access a sandbank in the river, which we then walked across to the boats, moored on the far side. And alcohol, as were soon to discover. 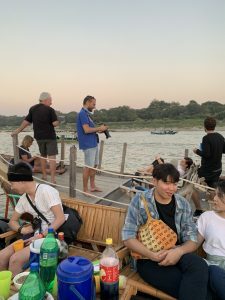 We all sat around on the 2 boats for about 15 minutes, while the all-important booze was passed round (for the record, we had no inkling about the free beer/gin/rum) & after what seemed an age, off we trundled to a point in the river where lots of other boats were moored. As soon as sunset was over, the revving and spluttering-into-life of all the engines started, in a noisy cacophony. After the sun set – quickly as is the norm in Asia – the German (?) manager announced that the booze was to be finished, and anyone who wanted to go back could stay on one boat (ours, thankfully) and anyone who wanted to stay and party a little longer should transfer to the other boat. Once all the youngsters (barring the sick young Frenchmen) were on the boat with the booze and the remaining snacks, our more sedate boat headed back. The charming Myanmarese crew helped us off the boat, in total darkness by now, and we trudged back across the sandbank, and back into the pirogue. And after alcohol (just one weak drink each in our case, but the youngsters were certainly knocking it back). How difficult or expensive would it be to give the crew torches? The views were pretty, it’s true. But it wasn’t what we’d hoped. If you want a cheap booze cruise, go ahead. If you want a tranquil moment watching the sunset, then Fantasia is not for you. We paid 5,000 kyat a head, and I guess the entire outing lasted under an hour. I paid my own way & didn’t mention that I blog and write reviews. 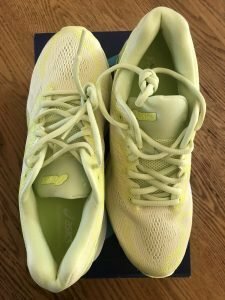 5 weeks ago, I posted my first review of the ASICS DynaFlyte 3, and since we have now completed another 100km together, I thought a quick follow-up review might be in order. 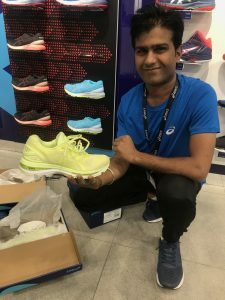 As I stated in my first review, I am a recently appointed ASICS Running Influencer in India, where I live, but the company has put me under no obligation whatsoever to write reviews, favourable or otherwise. Not once has anyone suggested I should even review their products. Right, it’s now been 2 months & 215km that we’ve been together, and so how are we doing, my lovely turquoise shoes & I? We are doing just fine and dandy, and I am every bit as impressed by these beauties as when I took them for their first run, exactly 2 months ago today 🙂 (So happy 2 months to us!). 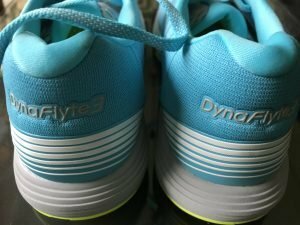 The DynaFlyte 3 continues to impress me with its lightness. 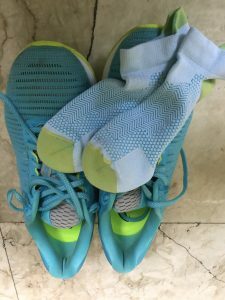 You lace them up and then can almost forget about them, since they are so light and un-clunky. 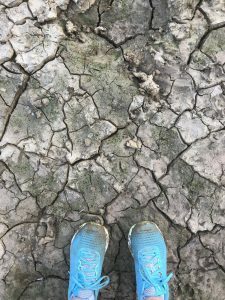 In the last 100km we’ve run together, there has been some road work on Delhi’s hard, unforgiving roads, but mainly on paths and trails in my local park. My shoes have got dusty and muddy, and been washed a couple of times – they come up looking as good as new! No chafing, no noticeable wear & tear. No feeling that the wonderful cushioned soles are wearing down. All round, I’m still delighted with them. 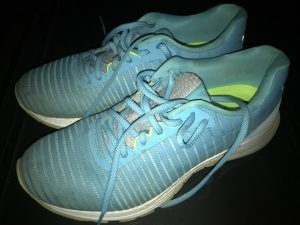 Since they are so sleek-looking (plus I LOVE the colour) I’ve worn them out and about a few times for non-running events. 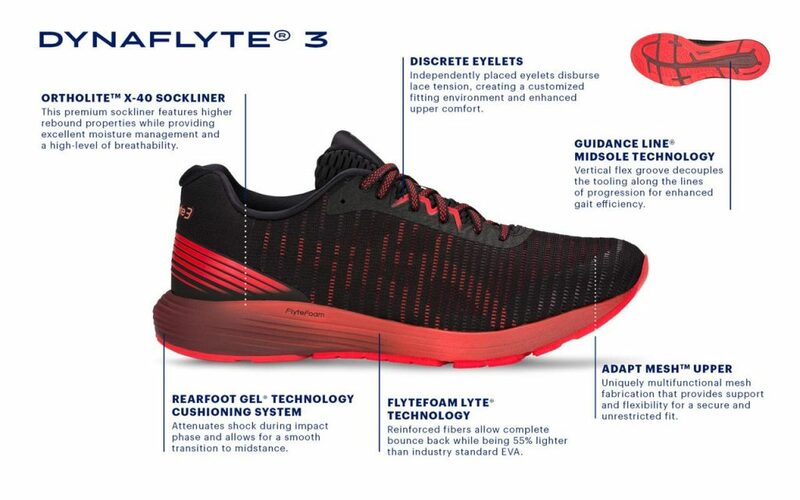 Looking forward to many more miles in my DynaFlyte 3. 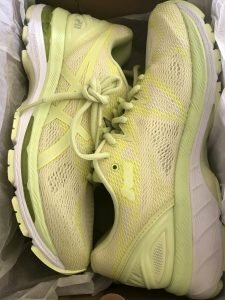 I am an ASICS Running Influencer, and, on the advice of my running coach & an excellent ASICS store manager, I chose the new Gel Nimbus 20, in which to run and train. 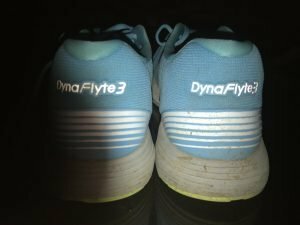 A couple of weeks earlier, I had bought the DynaFlyte3 & I alternate between these 2 pairs in my runs, as I prepare for a half marathon this week, a full in January and another full in February. Over the next few weeks, we’re going to be putting in a lot of mileage together. I must point out that ASICS has placed me under no obligation whatsoever to write a review, favourable or otherwise, of these shoes. So, what do I think about these shoes so far? 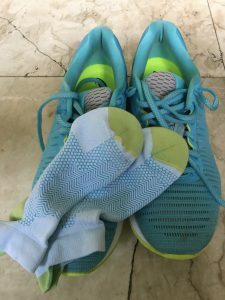 I have run 119.5km in my Gel Nimbus 20 (shall we call it 120km for simplicity’s sake?!) and am totally and utterly in love with these shoes. 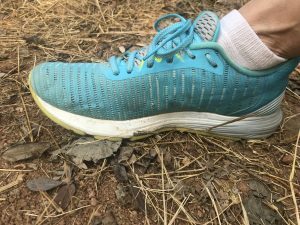 I have run in my Nimbus 20s on several different terrains in New Delhi, India, where I live – roads, parks, tracks, grass, & even some outdoor gym equipment, and the cushioning of these shoes, especially on the roads, is brilliant. Absolutely fantastic. 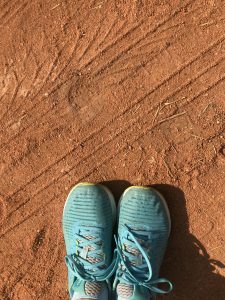 The shoes felt totally comfortable from the word go, and I have had no teething problems. They feel super light, despite the solid heel cushioning. I find the shoes light, as I said, and surprisingly sleek. We have many more kilometres to go, many of them on the hard, unforgiving Indian roads, so I’ll report back after we’ve run together some more. How good are the ASICS DynaFlyte 3? 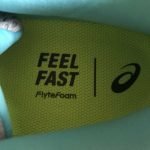 I have recently been named an ASICS Running Influencer, and, on the advice of my running coach, I chose the new DynaFlyte 3, in which to run and train. 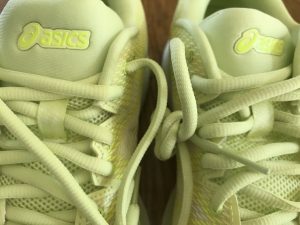 ASICS has, however, placed me under no obligation whatsoever to write a review, favourable or otherwise, of these shoes. I’ve only had these lovely shoes for 2 weeks, but have already run 101km in them, including a half marathon. So I feel that a “first impressions” review is in order. 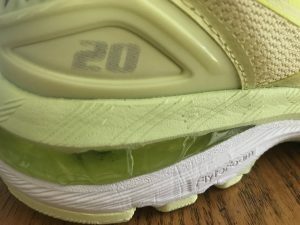 I’m just a humble runner, not a running-shoe expert, so this might not be as technical a review as it should be. As I said, from the outset, the shoes felt super comfy, and I have had no discomfort, no blisters, nothing. 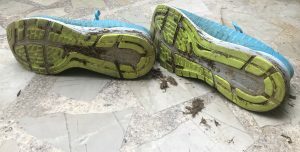 I wondered whether running a half in them, after only 80km testing, was a good idea, but since they had felt so good since Day One, I decided to go for it. We had a good run (gold medal in my senior age category) so my DynaFlyte 3s and I have got off to a great start. As the tag line says, I did indeed “feel fast”. The shoes also feel incredibly light. 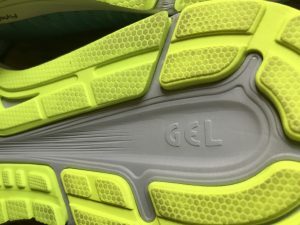 Then there’s the Flytefoam gel being Lyte technology midsole, the combined effect of this and the gel making the shoes feel incredibly bouncy. 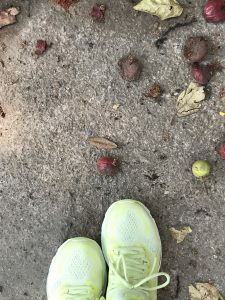 I know that “bouncy” is not a technical term, but it is most definitely the way these shoes feel – lovely and bouncy. They are easy to put on, and fit snugly. The ASICS logo is super discreet, and (in a cool touch) it is almost more visible when a light is shone on it – making them, I imagine, strikingly visible at night. I’ve yet to run in them in the dark, so cannot speak from experience to that, but look at how the logo can be seen when the flash is on, in the photo above. The name on the heel is also highly visible when light is shone on it. 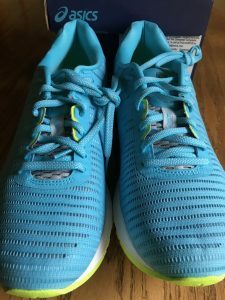 I’ll keep on running in these shoes over the coming weeks and months and will post a couple more reviews, as we evolve together. I love the colour. Absolutely love it. The shoes feel super light. You almost don’t feel they’re there. 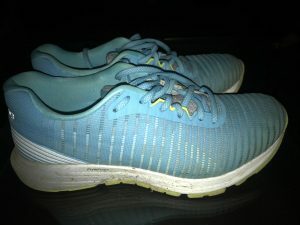 Despite the lightness, they cushion your feet perfectly. 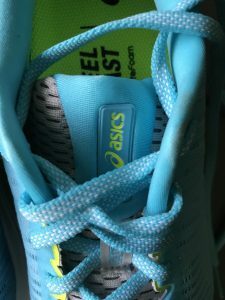 The laces are easy to hold and tie. Pretty much love at first sight for me, and since we won a gold medal together, I think we’re going to get along just fine together. 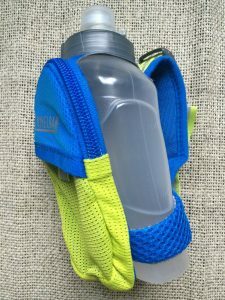 How good is the Camelbak Arc Quick Grip? 3 years ago today, I bought myself a super useful water bottle, the Camelbak Arc Quick Grip. How do I know it was 3 years ago today, do I hear you ask? Through my photo archive, that’s how. I took the photos used in this review on the day I bought it. For the past 3 years, I have used this convenient, hand-held water bottle on a very, very regular basis. Not quite daily, but on average 5/6 times a week. 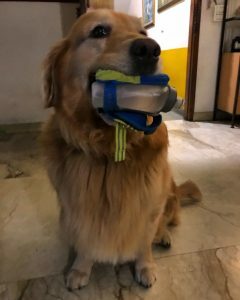 I use it when I go running, when I walk my dogs, and I take it on my travels. It is almost as good as new, despite heavy usage, and the occasional “helpful” carrying by my big goofy dog. There are 2 pockets, one of which zips, and where I usually put my car keys. I find I can carry enough water (300ml) for a regular run, as well as keys, Kleenex and a few nuts or sweets. It is tough, light, easy to drink from, doesn’t leak, & is curved to fit one’s hand. A good buy, and excellent value because, as I said, mine is still going strong after 3 years of heavy use. 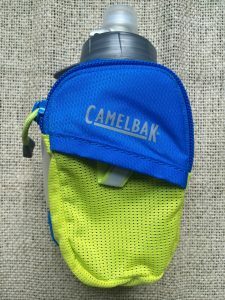 I bought my water bottle, and Camelbak has no idea that I blog or write product reviews. 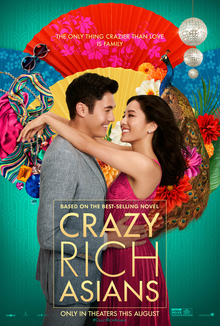 “Crazy Rich Asians” is a happy, feel-good, rom-com with a twist. Which is…that every single actor is Asian. I think there might have been a few, inconsequential non-Asians in crowd scenes, but all the parts, big or small, belong to Asians, and there was a real coming-of-age feel to the film. Oh yes, hang on, there were 2 snobby Brits and a nice Brit in the opening scene of the film, but those were, I think, the only non-Asians who spoke even a couple of lines. In the sadly depressing world in which we live today, a happy film, peopled by gorgeous youngsters, wearing amazing clothes, is just the tonic one needs. The film is based on the book (which I reviewed in my book review blog a few weeks ago – here you go, here’s the link) but there is enough divergence to make the film different. Most of the actors were beyond perfect for their characters. 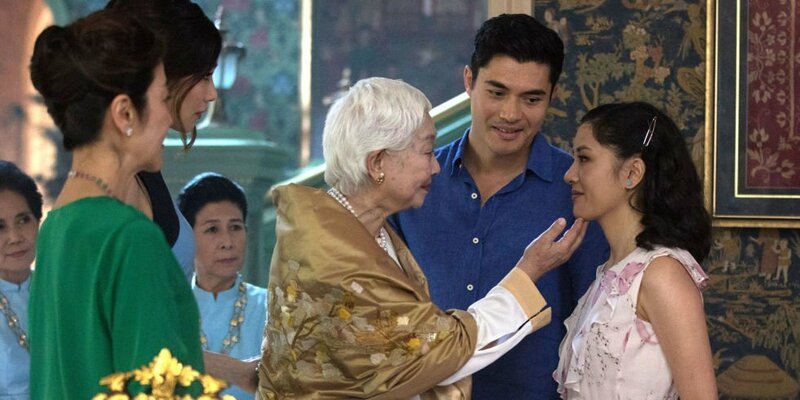 The dreamy Nick Young is portrayed by the totally dreamy Henry Golding, seen here (below) with his true love, Rachel Chu (right) and his formidable grandmother, played perfectly, absolutely perfectly, by the wonderful 91 year old Lisa Lu. Michelle Yeoh (above) is also perfect as Nick’s manipulative mother, though Eleanor is not half as wicked on screen as she is in the book, I might add. 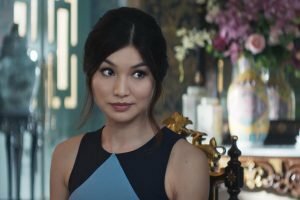 Gemma Chan as Astrid is spot-on. Drop-dead gorgeous and with an ethereal quality to her. Although much of the frenzied shopping trips, the endless name-dropping, the luxury one-up-man-ship of the book is missing from the film, the world of luxury and privilege is there for us all to see. Singapore looks smashing, and seeing it on screen made me want to revisit, after way too many years away. This is a fun, visually gorgeous movie. You absolutely don’t need to have read the book at all to enjoy it, not at all. My daughter and I had both read and loved the book, & we both thoroughly enjoyed the film. My husband hadn’t read the book, and also thoroughly enjoyed the film. Nico Santos (below) as Oliver. He is perfect. Awkwafina (below) as Peik Lin. She is a scene stealer. Absolute star. Who else did I love? 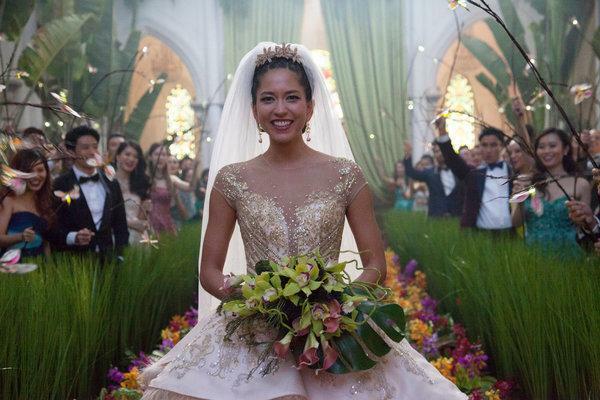 The gorgeous Sonoya Mizuno as Araminta. It is visually gorgeous, has a happier ending than the book, and even made me shed a tear or two. 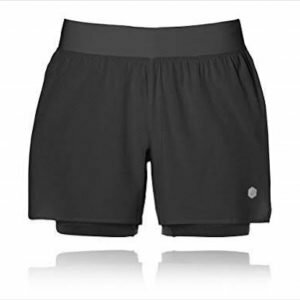 How good are ASICS running shorts? Along with about 30 other people in my running group, I was given the shorts I am about to review by ASICS, as part of our team kit for the Ladakh Marathon last month. 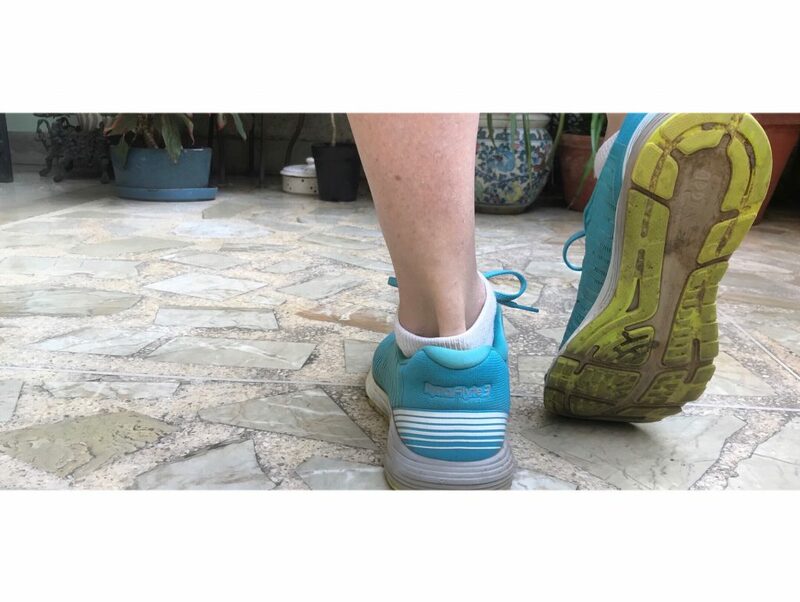 By way of background, I live in New Delhi, India, in a society not really given to women wearing shorts, so in the 5 years since I started running, I have tended to stick to wearing long running trousers or capris. 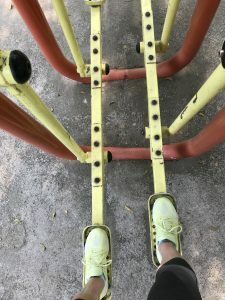 But Delhi’s summers are brutally humid, so last year, wearied of always feeling so hot & sticky while my male colleagues ran in shorts, I experimented with a pair of shorts with a flap in front – making it look more like a tennis skirt. So I bought another pair, same design, different, lighter fabric, but still with the flap thingy in front. So when our ASICS running coach gave us all Ts and shorts for Ladakh, I privately decided I’d probably not wear the shorts that much, given previous experience. These shorts are super light, and in the weeks that I have worn them, have not given me one moment’s discomfort. Not one moment. To run chafing-free in high humidity…what a relief. The shorts are so super lightweight that you hardly notice you’re wearing them. They have no seams to chafe, have a small zipped pocket, just enough for a key for instance, and the pocket is lined in rubber – sweat-proofing, I assume. I have worn my shorts in Delhi, in Ladakh, and in hot and humid Bangkok, and I am already a fan. They are discreet – thanks to the double layer. They are ultra lightweight. They have a pocket. Tick all the boxes. Personally tried & tested & recommended. I was not asked to review these shorts, by the way. There are food courts in malls the world over. 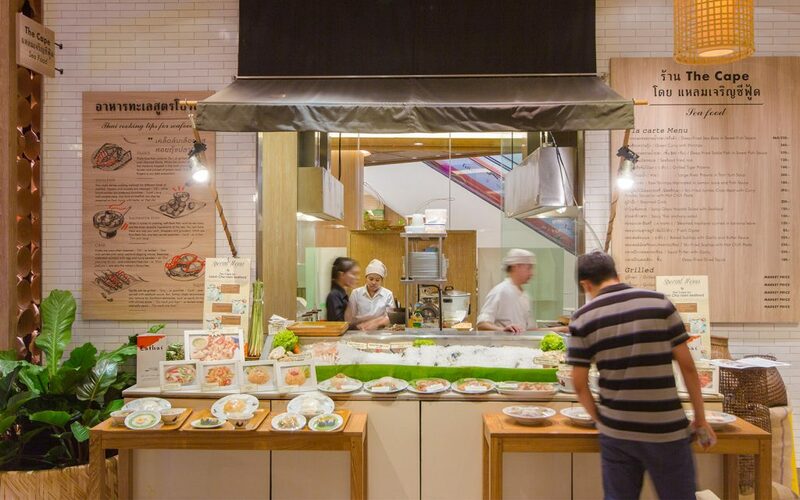 And then there’s Eathai in Bangkok’s Central Embassy Mall. Eathai is in a class of its own, and deservedly so. 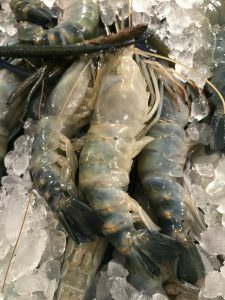 Amazing food, amazing variety of cuisines, and all served with elegance and – important in a food court where there are lots of office workers – efficiency and speed. As tourists, we had all the time in the world, but for office workers, quick, efficient service has to be key, and Eathai delivers. Whatever one thinks off food courts, they work for a couple like us: hubby highly allergic to any form of fish and shellfish + I don’t eat any kind of meat, but do eat fish + he loathes chillies (AND he’s Indian :P) and I crave ‘em. Plus, and this one is on us, we don’t speak or read a word of Thai. 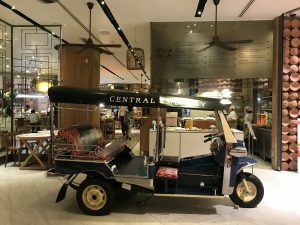 Eathai showcases Thai cuisine from all over the country, at separate food and cooking stations and – one thing I really appreciated – detailed explanations in English on the menu boards (above). The system is very easy to use. On entering the vast Eathai, in the basement of the mall, you are given a credit card which you use to buy your food. And you settle at the cashier’s on the way out. So no issues there. Since the food court is, as I said, vast, you never feel crowded. Tables have lots of room between them, and the staff even deliver dishes that require more cooking time to your table. 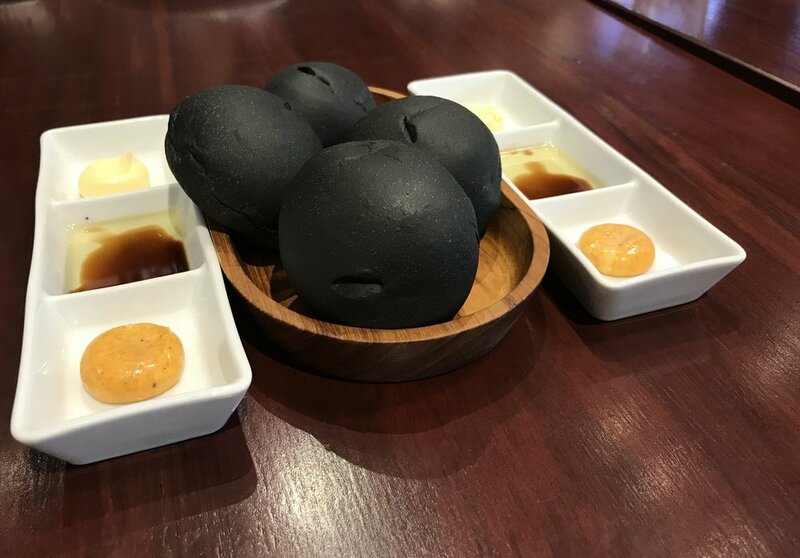 I had scallops and garlic – it might not look anything special from the photo, below, but it was pure heaven. 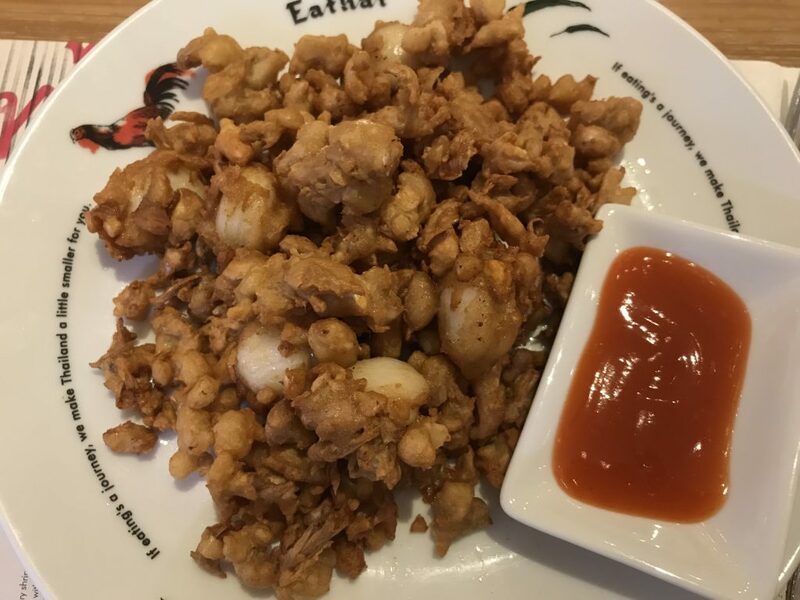 Eating at Eathai is definitely more expensive than eating at a street food vendor, but for the location, the air conditioning, access to loos, service – it can’t be beaten. This is a food court like no other. We paid our own way (Baht 525 for 2 of us) and no-one in the mall knew that I blog or write reviews. If you haven’t ready been to see “Aladdin”, do so now! Judging by the tragically more-than-half-empty auditorium last night, people are not exactly flocking to see this great musical production. In the short speech of thanks after the show, the director Shruti Sharma specifically thanked us all for coming “on a Tuesday”. I do hope she hasn’t had to make a similar comment about every other day of the week. I really & truly hope for the remaining shows that the Jawaharlal Nehru Indoor Stadium is packed, and (sorry for saying this) packed with a more appreciative audience than ours last night. When we arrived, the delightful crew of ushers (more anon) told everyone to move further down towards the stage, regardless of where our purchased tickets were. There were stickers on row after row after row of seats, indicating they were empty. How disheartening for the cast, especially since they went down into the audience at times to sing, and so would have been confronted by rows of empty seats. Perhaps we just got a particularly dull & unappreciative audience, but my goodness me, were they stinting in their applause. A cast of super talented youngsters sang and danced their hearts out, and there was scant applause, and when we stood up to give them their much deserved standing ovation at the end, we were asked to sit down by the people behind us. Anyway, this review isn’t actually about the people sitting around us, arriving late, checking their mobiles during the show, hardly applauding – no, begone with such dull, unappreciative souls! This review is about the amazing singing and dancing and the enthusiasm of this talented cast. The show was great fun, and there were moments of sheer magic – the magic carpet for one. We were a group of 6, namely 2 sets of parents with their 2 daughters, both in their late 20s (bet you thought I was going to say they were little girls, right?! :P) and let me tell you, these 2 young ladies, die-hard fans of the 1992 film, a staple of their childhood, were very excited and also very intrigued at how the magic carpet scene would play out. Just let me say that it was brilliantly done (I won’t spoil your surprise, don’t worry). A super moment that did not disappoint. It is invidious to single out individual actors, in what was a great all-round ensemble effort, but the show stopper is the Genie, played by Mantra, and he is an absolute knockout. Weaving Hindi into the script, with local jokes and references, he is absolutely fantastic. 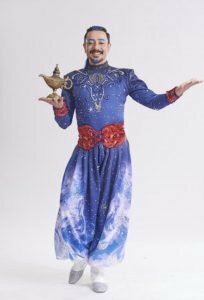 His arrival on stage created an instant buzz, and his portrayal of the Genie as slightly camp was hilarious. 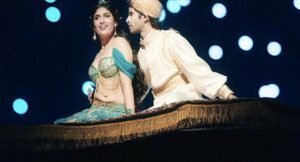 An insight into just how much wonderful singing and dancing talent there is here in India – for this is an entirely Indian cast. So, if you haven’t already seen Aladdin, what are you waiting for? Hurry up & go, and PLEASE applaud and show these hard working artists that you appreciate their talent. Oh yes, the ushers. Remember I mentioned them at the outset? We paid for our tickets, and no-one connected to the show knows that I blog and write reviews. 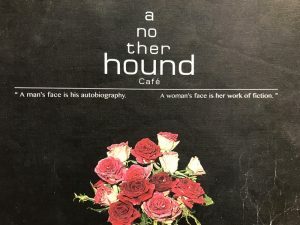 Another Hound Café, located in the plush Siam Paragon Mall, came up trumps. 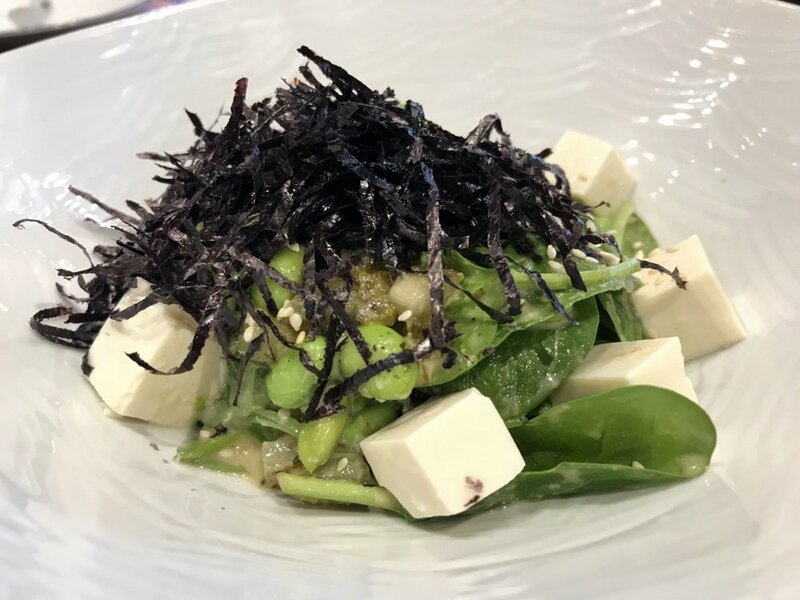 Billing itself as Italian with an Asian twist, the café is stylish and quirky, with excellent service. We all ate well, and we all had interesting, different, not your usual run-of-the-mill food. 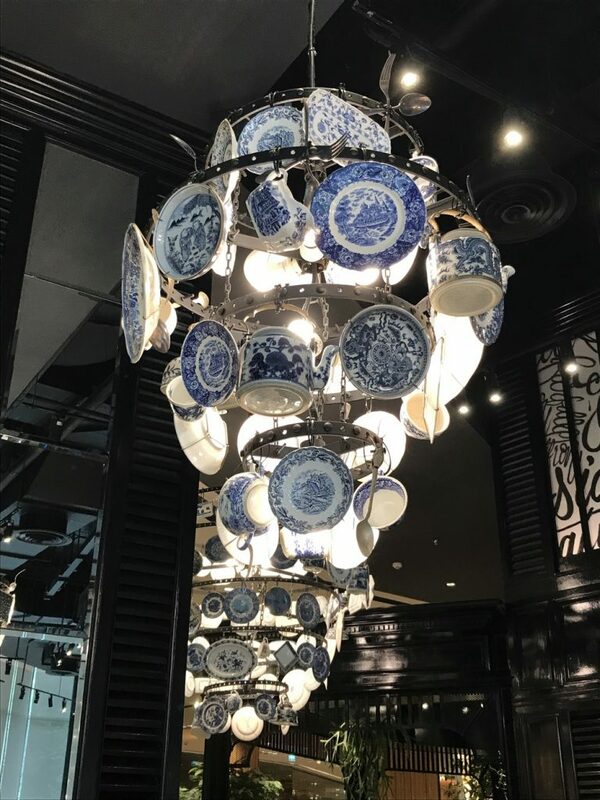 Plus they have the coolest “chandeliers” ever. 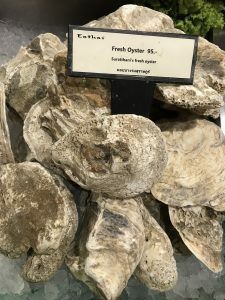 The café’s justifiably popular oyster platter starter (below) was divine. 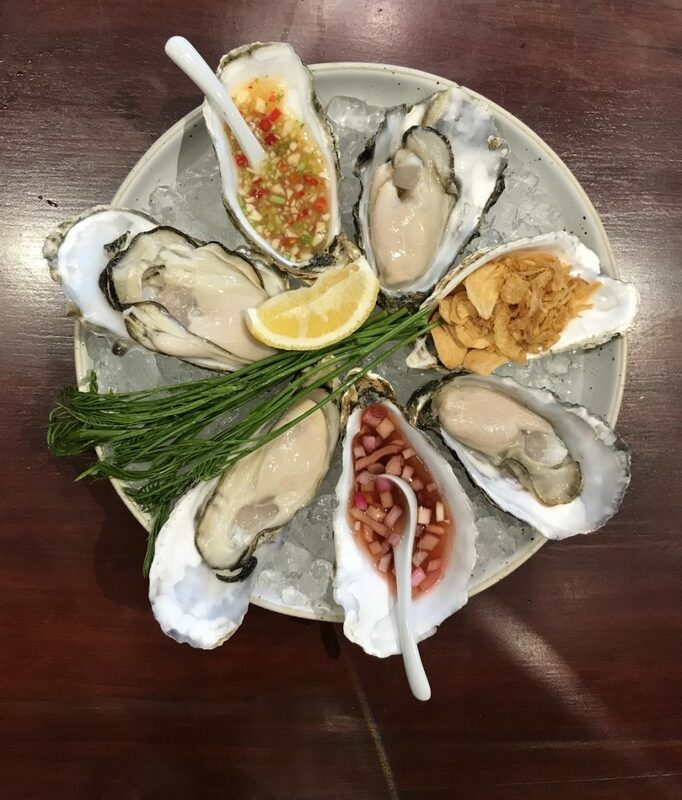 4 huge oysters served with very interesting dipping sauces, a bowl of fried shallots and cha-om tips (climbing wattle). Everyone was happy with their food, and we all tasted as many of the dishes as our complicated dietary requirements permitted. 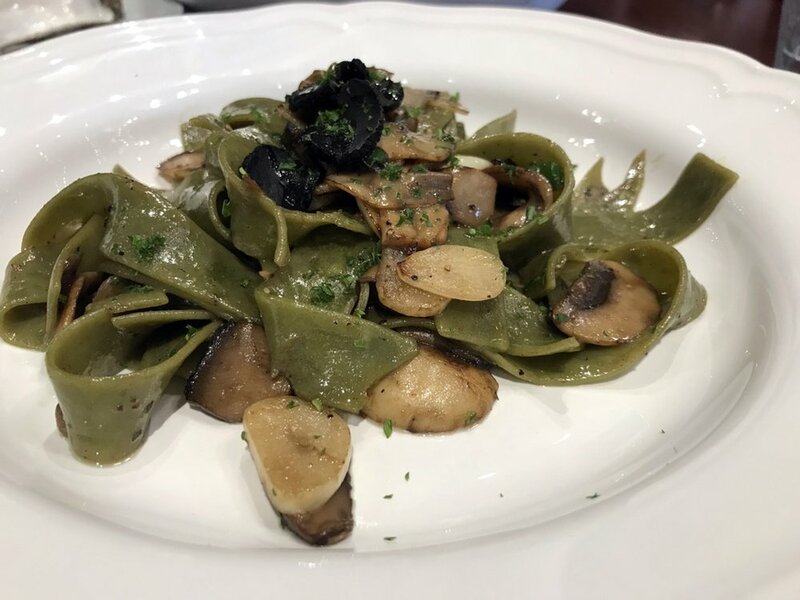 Below is a simple-sounding spinach tagliatelle dish was excellent. Good food. Polite efficient service. We paid our own way, and I didn’t tell the staff that I blog and review.